Ebates: Earn Cash Back While You Shop! You are here: Home / Great Deals / Ebates: Earn Cash Back While You Shop! Ebates is a cash back site for your online shopping needs! All of this info will be very important leading up to Christmas! We can shop and get great discounts AND cash back! What could be better than getting discounts and being paid to shop! It’s FREE to sign up and you can get a sign on gift card bonus of your choice! 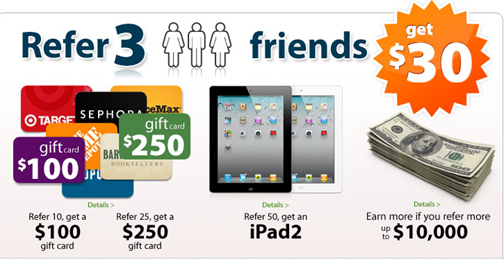 You can also refer your friends and family and make money! People often ask: "This sounds too good to be true, how are you able to do it?" It really is quite simple. Just like almost every other online shopping center, we get a commission from the stores when you make a purchase. Instead of keeping that money – like almost all other sites do – we share it with you! So, as long as 1200+ of the world’s top online stores are happy to pay a bonus to attract the new, valuable customers we send their way, Ebates is going to continue to send Big Fat Checks to our satisfied customers across the globe. So, sign up now and get yourself ready for the Christmas rush – get your friends and family to sign up, too so you can get ahead of the game!